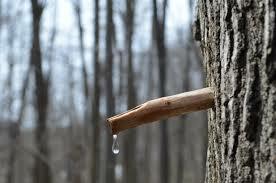 Koleine Law has reported that the Maple Syrup has been flowing good this year. 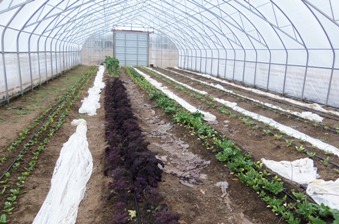 The above picture is the inside of one of the hoop houses at White Pine Farm. Inside it is a few things that are ready to be harvested, although in limited quantity as not everything is good enough quality. When harvesting happens they may find they have more than they put on the website so please request it in the comment section. 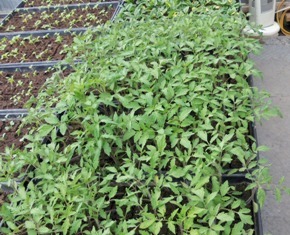 This picture is the tomato plants waiting to be transplanted into one of the hoop houses. Delbert from GCC Organics reported that the pullets are starting to lay eggs. Pullets are the younger chickens and when they start laying they lay smaller eggs. As the chickens get older the eggs get larger. They will next order cycle have turkey parts available on the website. White Pine Farm will be planting onions soon, for anyone that would like to help with this task you are welcome to contact us to get details, you will also get a farm tour. It may not seem like much of a miracle, but pulling off this market often feels like one. There are other markets in other states that do very similar markets. They give their customers about 2 days to order and the farmers 5 days to get the orders together. Some monthly markets actually give the farmers about 10 days to get the order together. We are the other hand give the customers about 4 1/2 days to order and us only about 2 1/2 days to harvest and gather product. Since we give ourselves such a narrow window we will eventually be shortening the order time we give customers. This I believe will give us a little more time to deal with issues that arise and more time to pay attention to detail. The future time we plan to be open the market will be 7:00 pm on Thursday and we will close the market Monday night at 10:00 pm. On Thursday it sometimes is a madhouse here because we are packing orders at the same time when the market is being opened and it is often that the farmers that have just harvested their crops are also packing their items and they have not always had time to update the website. At the same time we have to back up all files, edit invoices, write the weblog in HTML before we are even down packing order and by 3pm we would love to have all our hair in our head. Adding three hours for us at the beginning of the market would make a huge difference and the two hours at the end of the market would also help. The beginning time will be implemented before we go onto a weekly order cycle. The closing the market time we be implemented sooner. Walk In Freezer Fundraiser Update <———- We have raised $1,142.65 so far! THANK-YOU! The people have contributed so far, listed in order of largest amount to the smallest is to the left side of the Weblog. The kitchen is almost done, we just have a few minor things to do before we get it inspected. Marian & Dale have been working hard to make the kitchen happen and we shipped a lot of things out to Fritz Auction to make room and to provide a little cash flow to help pay for the expenses associated with the kitchen. Marian’s printing press operation had to get moved aside to make room, at 850 lbs per press moving them was a hernia challenging experience. The walk in freezer is our largest expense that we will be facing and we need all the help we can get on it. All proceeds collected here are going to the walk in freezer fund. We do have a ways to go before we have enough to fix the freezer. Other things that can be done to help is collect paper grocery bags so that we don’t have to buy so many of them, donating used ink/toner cartridges that we can recycle in exchange for paper products we need for the market. We do have some other fund raiser plans in the works. Here is a little history on the Freezer. Dale & Marian bought the freezer walls, floors and the condenser. Dale with the help of a friend Vince poured the cement pad and assembled the freezer. Brand new freezers this size are way beyond our means. Used freezer compressor are almost always bad or short lived so we knew that would be an additional expense. The freezer currently needs a compressor, rubber roof and door trim. The temperature in the freezer will be much lower than standard commercial freezers. Please note that these contributions are not tax deductible. A $20 contribution receives an antique historic wine bottles. All other expect an item to show our appreciation. Click here to see whats available! Many of the farmers participate with the operation of this market, and when no unexpected events/emergencies happen the market runs almost as smooth as clock work. I received a panicked phone call from Racheal that she can’t open the market today because goats are out. So alas today I have to click the mouse, change the wordings and open the market. Tuesday morning the farmers know what products they have to prepare for the market. CSA Farmers Market action starts Wednesday night when one of our helpers creates reports for packing frozen & dairy and prints the invoices, envelopes and other miscellaneous paperwork that enables us to get the farmers products to you. Michele from Fallen Oak Farm brings her items over and assembles the envelopes, invoices and packing reports than places them in the appropriated distribution location basket. Thursday Morning Kurt from Ulrich Farm arrives with his items and packs up the orders that is suppose to go the West distribution area. Barb a helper takes the van and heads of to Almars where she meets with Linda Purdy from Westwind Mill and Pat Whetham from Whetham Organic. Orders going to the West side are packed and everyone takes the orders to their respective farms for customers. The items they have for the East area are loaded in the van and taken back to White Pine Farm where Dale Kinney from White Pine Farm, Joe Law from Law Family Farm, Doreen Wilcox from BF&E Organics, and our helpers start to pack orders. As they are packed they are put in totes and placed in the walk in cooler. Of course frozen items go in the freezer and CSAFM is operating five chest freezers right now (it is going to be wonderful when we get the walk in). Krystal Owens son gets off from the bus at White Pine Farm where we pack orders and she loads up products that are going to Healthy Habitz which she will deliver before going home. Friday morning Dale Kinney, Marian Listwak, and a helper go to White Pine Farm to load the van. We usually start loading at 7am as we carefully pack to make sure we don’t miss anything. Everything is color coded to help us know what to unload where it is suppose to go. If things go well we are on the road by 8:30 am to start delivering and the van does not arrive back until approximately 5pm. If I’m not helping with deliveries I usually stay close to the phone to deal with what every unexpected event that happens. We operate somewhat like a co-op where the farmers are expected to do their share of work. Not all farmers can help so they contribute a higher percentage of their sales as compared to the grower that can participate with helping at the market. Of course as always there is a fall person that fills in whenever any one is sick or goes on vacations or has to help friends whose goats get out. That person is me and if I don’t get back with everyone timely I can guarantee it is one of those weeks where I have to do double duty. And now since Krystal is off work—-I’m doing double duty. Place the slice of bread in a large bowl. Pour the milk over it, to soak the bread. Let it soak while you gather your ingredients and grate your onions. Then, squeeze out most of the milk from the bread, using your hand. Discard the extra milk, and crumble up the soaked bread back into the bowl. Add the egg, garlic, parsley, allspice, oregano, cumin, salt, pepper, grated onion, and lamb. Gently mix until all ingredients are well combined, and shape into 4-5 patties (or 4 patties and 1 toddler patty :)). Cook the patties on a grill or in a cast iron skillet on the stove top (or under your broiler), for about 4 minutes before flipping. Add a slice of cheese and continue to cook another 4 minutes, or until burgers are done to your liking. Top with some yummy lettuce and your done! We have two wonderful new soap companies coming to our group. This means we will have three entirely different soaps for you to choose from. We will still have the wonderful goat milk soaps offered by Pineberry Dairy from Silverwood Michigan. Now we are also offering natural bee product soap from Hive Made Products in Gladwin Michigan. If you prefer Omega rich olive oil soap we have Moon River Soaps made in Rochester Michigan. Rebekah Townsend from Hive Made Products is passionate about creating a safe enriching soap for her family and yours. She and her husband have taken vast steps for their family to live life simply and naturally. After making some changes to what they put inside their bodies, they decided to take a closer look at the products they used on the outside. They were motivated by what they found to create their own body care products. They became bee keepers in 2013 and now use some of their own honey and beeswax in these products. It’s their passion to share with others the healing and moisturizing qualities they discovered in their body care products. They run their apiary, make quality handmade body care products, and rear their three sons on the homestead in Gladwin, Michigan. Moon River soap maker Carlos and formulator Elizabeth Aprea, along with their daughter and son-in-law, make their rich moisturizing soaps in the beautiful sage green building downtown Rochester that they also call home. They discovered that synthetic fragrance in commercial soap was triggering her head aches and decided to research essential oils and botanicals. They created their fist batch of cold pressed organic olive oil soap with the knowledge gained from that research. They noticed that national baby wash was causing their grandson dry, irritated skin and after using the soap on him they saw his skin healed up almost immediately! They create this soap with a passion for healthy living and natural healing. They use natural NON-GMO ingredients that are free of chemicals and preservatives. Each hand poured bar of soap is made with omega rich olive oil, nurturing botanicals, and certified 100% pure essential oils. They never use petrochemicals, sulfates, synthetic fragrance or phthalates. Baking Linda Purdy (from Westwind Milling) has decided to give up baking, each year at about this time Lee & Linda Purdy look at their operation and decide what to change, they also closed their Many Hands Community Foods Grocery store located in Argentine. We will miss Linda’s Baking—As she sadly tells us that she has to give up baking at the same time she says how much she loves to bake. You never know she may decide to bake again. Spinach is growing and waiting for good weather to be planted out into the hoop-houses. Planted greens are waiting for sunny longer days. Seeds are ordered and many seeds are back ordered. Heaters are being installed, buildings are being cleaned and organized so when we get busy we can find what we need when we need it. It is now time to look at the biological insects to see what we need. Two years ago we lost one long row of kale due to the cabbage loopers, the butterflies may be pretty but the caterpillars are ferociously hunger for kale. Last year we released some microscopic wasps that loved eating their eggs and the damage was minimum. I love those tiny insects. They are the size of pin head and have an huge appetite for eggs. Dale Kinney from White Pine Farm is starting to plant. He turned an old freezer into a germination cabinet and is upgrading the attached green house so he can heat it. Last years cold weather contributed poorer than usual transplants. Each year he tries to improve and each year poses new first time challenges. On sunny days the hoop houses get very warm and the chickweed still grows like crazy. Even it what is suppose to be downtime for farmers is not downtime but bundle up time, long johns, carhardt coveralls, extra socks and what ever it takes to stay warm. The cows can stand in the field with the snow piling on their backs so long as there is water, food and a place to get out of the wind they seem content. Last extreme cold winter was one reason beef prices rose. When it gets cold animals put all their energy to staying warm and not towards growing. In some areas of the country it was so cold herds died. We were lucky our small handful of animals did well, they did not grow quite as much as normal, but they still did well. This winter so far has been a pleasant blessing, the early cold snap in November took out a lot of hoop house plants but so far after that the winter is somewhat more typical of an average year. Let us hope for a good spring so we can harvest fresh lettuce, kale carrots and more in March. I was forced to buy lettuce from the grocery store instead of eating our own from the hoop house and my first question was Where is the FLAVOR—-there was none, so I too am anxiously awaiting fresh greens.